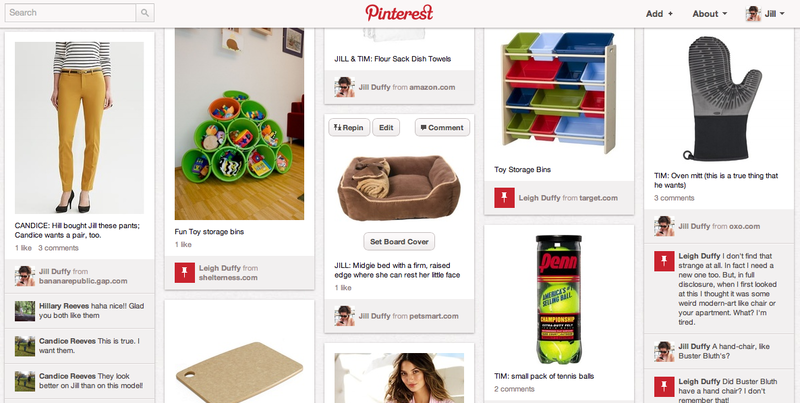 An experiment in using Pinterest for holiday gift lists. The earliest I have ever bought anyone a Christmas gift is August. This year, it's nearly December, and I've gotten nothing. Nada. Zip. Zilch. I'm behind on not just shopping, but also wrapping my head around a game plan for shopping. Sure, I've thought about budgeting for the holidays long enough to write about it, and have booked not one, but two car rentals for the holidays. (I made the reservations early, no money down, to lock in a decent price while not totally committing to which days I'm going to travel, and gave myself some flexibility in the car size because I'm not sure how many people are coming with me yet. I'll cancel one of the reservations in the next week or two.) And yes, I did initiate a collaborative wish list for gifts with my sisters way back on November 1. But that doesn't mean I feel ready for holidays one bit. Nor do I have a clue what I'm going to buy. Seeing as I don't know what to get, I couldn't take advantage of Black Friday or Cyber Monday, although it seems as if Cyber Monday is going to get extended into Cyber Week, so perhaps there's still time if act fast. The Thanksgiving Day holiday, which I've taken to calling American Thanksgiving because Canada celebrates her own special day of the same name in October, was tiring and sapped different kinds of muscle than the ones I'm used to flexing. Boyfriend and I flew to San Francisco Wednesday morning -- the same day his mother moved back into her own home after spending three weeks in the hospital (cancer and cancer complications). We were all thrilled to see her come home, but she's not exactly "recovered" as it were. We knew we would have to minimize excessive smells, like a roasting 30-pound bird, as well as any undue commotion, like too many people dropping by to say hello. Boyfriend's family is one of he most social I've known. Someone is always dropping by, whether it's Thanksgiving or St. Patrick's Day or just a Tuesday evening in June when the baseball game is on (go, Giants). Their/our close family friends offered to cook an entire Thanksgiving meal for his family and me and bring it over so we wouldn't have to do really anything at all other than clear off the dining room table. We took them up on it, and I know everyone was extremely grateful for their generosity. It removed a huge burden and to use the same phrase twice in one post, a number of trickle-down problems. And did I mention the dog? Not my dog. The other dog. Thanksgiving morning, we arrived at Boyfriend's mother's house and saw a black and white Border Collie mix licking the sidewalk. She looked thin and friendly. I was on the phone with my mom. "Hey mom, I'm going go. We just found a stray dog, but she definitely looks like she belongs to someone." She came when called, and sized us up as to whether we had any food. Someone got a bowl of water. She drank it down. We checked her collar, but it had no tags. She was thin and hungry, but clean and obedient. She sat when told and exposed her belly when I started to scratch her hind quarters. The scoop of cat food we set before her disappeared within seconds. 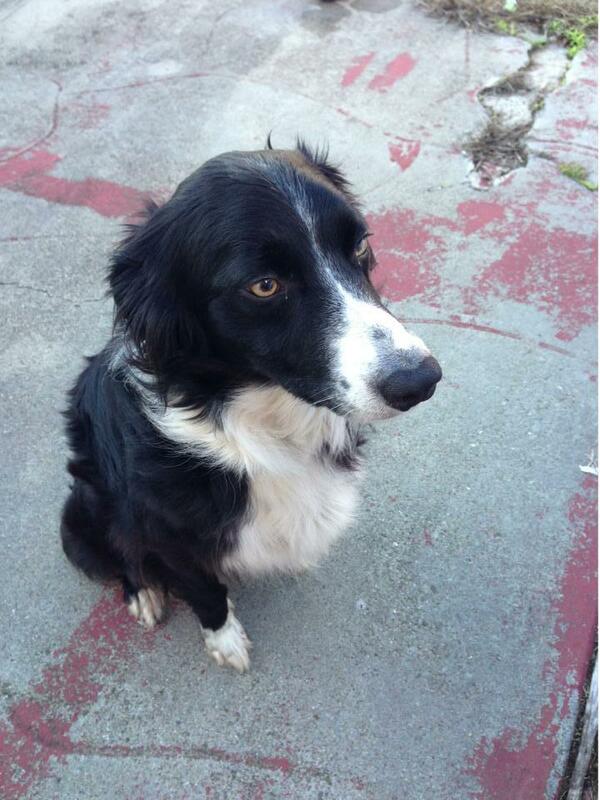 Lost Collie mix, female, found in San Francisco Thanksgiving Day. So we stayed outside, sure that her owner would come charging down the street hollering her name at any moment. But no one came. I posted her photo on Facebook and Craigslist, and looked for any other posting of a lost dog that fit her description. No luck. We jumped in the car, and she hopped right in, too, and brought her to an animal clinic that was open. The staff person scanned her neck for a microchip, and again, no luck. So we drove all the way downtown to the Animal Care & Control center and signed her in for a room. Everyone said her owner would most likely claim her, since she clearly belonged to someone, but we left a phone number just in case. That all took place Thanksgiving morning, mind you, when no one wants to work and no one wants to figure out what to do with a stray, but very sweet and well-trained, dog. 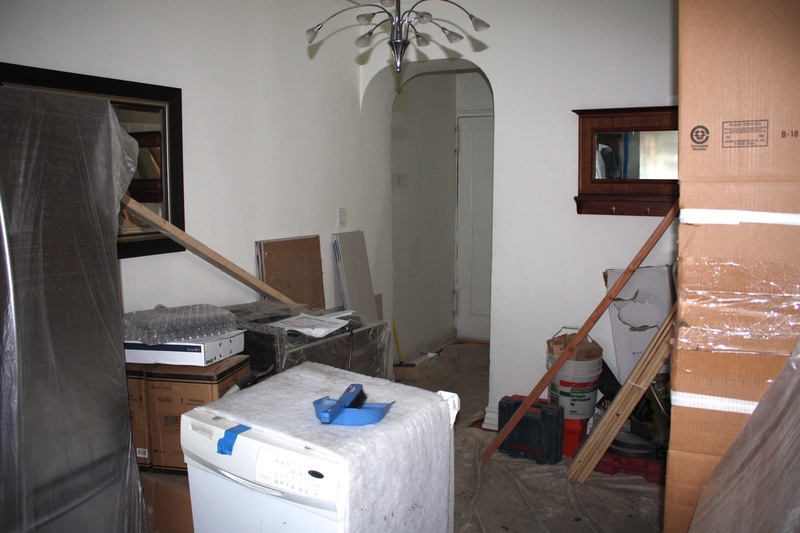 encroaching on my dining room back in September. I'm also behind where I would like to be fixing up the dang house. We moved into our apartment seven months ago. For the most part, we have what we need and are comfortable, but there's still more to do. I knew it would take a while to get the kitchen disaster in order, which it now is, but I neglected to consider the trickle-down effects. Remodeling the kitchen wiped out my savings, and thus, I have no money to spend on a new rug for the living room, chairs for the dining room, or all the shelves, bins, paint, curtains, and other odds and ends that, you know, tie the room together. It'll get there, I know. But right now there are so many other things vying to be made a priority: going to the gym, food shopping, work, blogging, creative writing, cleaning. Some of the things I'd like to catch up on require more focus, though. I either need to set aside the small stuff and tackle Christmas shopping or home decorating full-on, or let them slide a few more days while I take care of the more habitual stuff.